Circuit of The Americas (COTA) today announced two of the biggest names in world music as its headliners at the 2018 FORMULA 1 UNITED STATES GRAND PRIX. 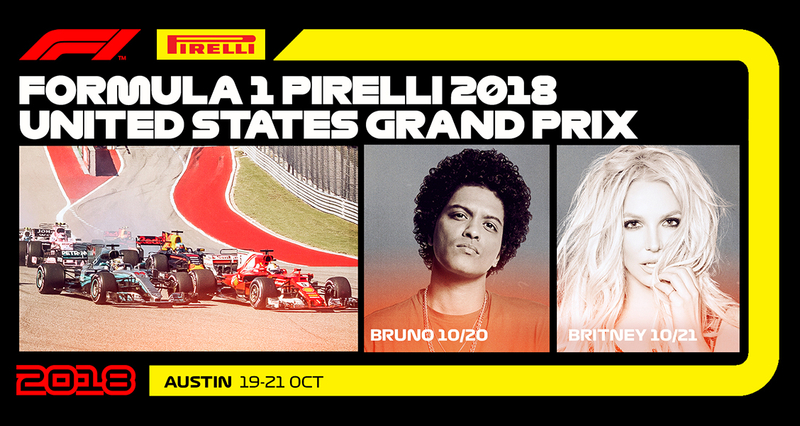 Global superstar Bruno Mars will perform on COTA’s SUPER STAGE on Saturday, Oct. 20th after Qualifying has finished on track before international pop icon, Britney Spears will close out the weekend on the same stage on Sunday, October 21st, following the F1 USGP race. Tickets for the 2018 FORMULA 1 UNITED STATES GRAND PRIX, set for October 19-20 will go on sale this Friday at 10AM. Bruno Mars is bringing his entertainment-packed “24k Magic World Tour” show to COTA to light up Saturday night of the F1 US Grand Prix weekend. The 27-time GRAMMY Award nominee and celebrated singer, songwriter, producer, and musician has sold more than 180 million singles worldwide, making him one of the best-selling artists of all time. Recently, his critically acclaimed and RIAA certified double-platinum album “24K Magic” marked his highest first week sales debut, remaining in the Top 10 on the Billboard 200 for an impressive 44 consecutive weeks. The lead hit single “24K Magic” is certified four times Platinum by the RIAA. International pop icon, Britney Spears will close out the weekend’s celebration with a post-race concert on Sunday, October 21. As her “Britney: Piece of Me,” upcoming world tour is kicking off this summer, which follows her award-winning and record-breaking headlining Las Vegas residency, Spears solidifies the star-powered race weekend. The multi-platinum Grammy Award-winning singer is one of the most successful and celebrated entertainers in pop history with nearly 150 million records sold worldwide. Spears became a household name as a teenager when she released her first single “…Baby One More Time,” a Billboard Hot 100 No. 1 smash and international hit that broke sales records with more than 20 million copies sold worldwide and is currently 14x Platinum in the U.S. Her musical career boasts countless awards and accolades, including six Billboard Music Awards and Billboard’s Millennium Award, which recognizes outstanding career achievements and influence in the music industry. Three-day race tickets which include access to both headlining concerts along with other featured entertainment including an additional 30+ Texas based bands soon to be announced, start at $169 and will go on sale Friday, April 27th at 10 a.m. through circuitoftheamericas.com/f1. Sunday only bleachers and Sunday only Premium Stand tickets will also be available for purchase as well as upgrades for concert premium viewing. For tickets and more information, please visit circuitoftheamericas.com.